The Goa Board of Secondary and Higher Secondary Education (GBSHSE) is the body responsible for declaring Goa Board SSC result 2019. The students will be able to access their results on the official website of the board. The official date of GBSHSE Class 10 Result 2019 is expected to be announced soon, the approximate date of the GBSHSE Class 10 Result 2019 is assumed to be around May 20-25, 2019. However, until the GBSHSE officially announce the GBSHSE Class 10 Result 2019 date, the rumours regarding the delay in the announcement of Goa Class 10th Result will keep the students anxious. Until then, the students need not to fervently search for GBSHSE Class 10 Result 2019. JagranJosh will also share the GBSHSE Class 10 Result 2019 here at the time of the official announcement. To stay updated regarding the same, you can also subscribe to the email alerts by providing your email id and mobile number in the form provided on the top of the page. The Goa Board of Secondary and Higher Secondary Education has maintained a complete silence and haven't announced any official date for the declaration of the GBSHSE Class 10 Result 2019. It has been challenging for the student to find out reliable and correct information about the declaration date of the Goa Board Result. As of now, the GBSHSE Class 10 Result 2019 is expected to be announced in the last week of May 2019, the speculations are based on the assumptions that the time required to process and upload the GBSHSE Class 10 Result 2019 should be around 45-60 days from the date of completion of the examination. In addition, the Goa Board seems to be following the same trend since last few years. The Goa Board SSC Result 2018 too was declared on May 25. Looking at all the above-given factors, it seems that the Goa Board would follow their annual academic calendar and declare the Goa SSC Result 2019 at the same time. The Goa Board students out of inquisitiveness tend to speculate their Goa Board SSC Result scores and may start having unrealistic expectation from their Goa Board SSC Result 2019. The mind filled with lofty ideas about the probable Goa SSC Result 2019 scores may lead to disappointment after the announcement of the result. To avoid this and get an idea of the marking pattern and expected Goa SSC scores, the students can look at the previous year statistics given below. The GBSHSE Board had conducted the SSC Class 10 examinations from April 2 to April 21, 2018. According to reports, 20,238 students had appeared for the examinations. If we consider the past records, the students can expect a good cumulative score in the GBSHSE Class 10 Result 2019. As for the individual GBSHSE Class 10 Result 2019 scores, it will depend on their individual performance in the examinations. Where to Check Goa SSC Result 2019? The GBSHSE Class 10 Result 2019 will be available through the board's official website i.e. gbshse.gov.in; once the Goa Board announces the GBSHSE Class 10 Result 2019. The students will also be able to access their GBSHSE Class 10 Result 2019 through this page on the website. Despite rigorous efforts of Goa Board, the official portal might face some technical glitches due to the heavy traffic on the announcement date of GBSHSE Class 10 Result 2019. As an effective solution, JagranJosh will provide live links on this page for the students to check their GBSHSE Class 10 Result 2019. To view and download the GBSHSE Class 10 Result 2019, the students are required to follow the simple steps as instructed below. We understand that students who are waiting for their Goa 10th Board Results are under severe pressure. The rumours and misleading information about the announcement date also add to this stress. To help them out, we would be providing regular updates about the upcoming GBSHSE Class 10 Result 2019 here on this page. All the updates about the declaration date, changes in declaration date, online checking procedure and even key statistics about this year's and last year's Goa Board Result can be found on this page. The students are requested to visit this page regularly to get this information. Alternatively, you can also subscribe to email alerts by providing your mobile number and email id on this page. How to Check Goa Board 10th Result 2019? In order to check their respective Goa SSC Result, the students need to follow the below-mentioned instructions and provide the requested information in the fields provided. Visit goa10.jagranjosh.com or scroll to the top of the page. Once the students submit their roll number and other necessary details they will be able to view their Goa SSC Result 2019. 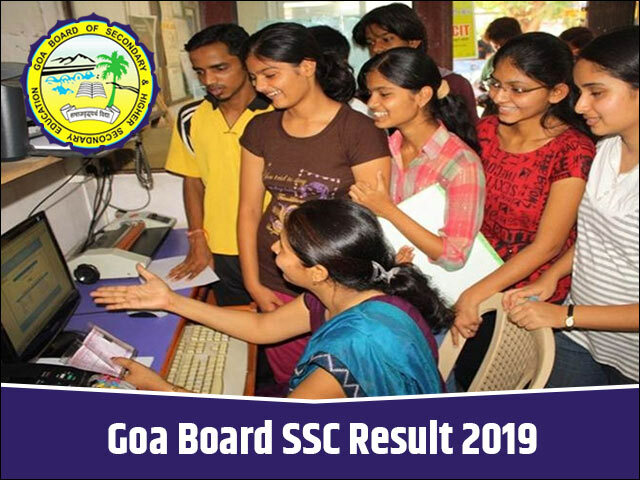 The online Goa SSC Result has been provided to give you swift info regarding the scores of GBSHSE Class 10 Result 2019. The original mark sheets will be delivered to your schools after 15 days of the declaration of GBSHSE Class 10 Result 2019. The board provides the opportunity to the students who are unable to qualify in the examination by conducting the supplementary examination, the students will be able to apply for the GBSHSE Class 10 supplementary examination within 15 days from the declaration of result or as notified by the board. The supplementary examination will be conducted in the month of June 2019. Additionally, the students can opt for re-verification or recheck of their examination papers, if the GBSHSE Class 10 Result 2019 scores do not satisfy them. The revaluation result will be declared within one month time. Any changes in the Goa Board SSC result 2019 will be updated in the original marksheet of the students. The Goa Board of Secondary and Higher Secondary Education (GBSHSE) was established in the year 1975 through the Goa, Daman and Diu Secondary and Higher Secondary Education Board Act, 1975. The responsibilities of The Goa Board of Secondary and Higher Secondary Education (GBSHSE) includes advising the government on education policies, implementation of education policies in the affiliated schools and conducting evaluation through yearly examination at secondary and higher secondary level. In line with this, the GBSHSE conducts the annual board exams for the SSC and the HSSC students every year in the month of March-April followed by the declaration of the Goa Board Result 2018 in the month of May. Goa Board has released the exam date sheet for Class 10th Board Examination. Candidates can click here for further details. The Goa Board of Secondary and Higher Secondary Education (GBSHSE) has announced the GBSHSE SSC Results 2018 today. This year, the Goa Board conducted Class 10 examination from April 2 to April 21. The 10 Goa Board Resuls are now available on the official website of the board i.e. gbshse.gov.in. The GBSHSE has announced the Goa Board SSC Result 2018 today. The GBSHSE 10th Result has formally declared the result on the official website, gbshse.gov.in.